I borrowed the audiobook Garden of Beasts by Jeffery Deaver from the library simply because it had a similar name to the biography of Ambassador Dodd which I recently read and wrote about. That book was wonderful and this was amazing, both in different ways. This novel started as a 30s gangster crime novel, threw in some Forest Gump "Hey I met someone famous" events, was a detective thriller, was set in Hitler's Germany of the 30s, and was a bad-man-with-a-good-heart story. Plus a love interest. So, that long list sounds like Mr. Deaver might have over-reached, but he really didn't. This book kept me awake and quilting til the wee hours just to finish it. For some reason I can't remember, I decided that I didn't like Jeffery Deaver novels years ago, but now I'll have to give them another try. Last weekend I felt the need to let quilting be my creative outlet. I've been collecting Fossil Fern Fabrics and have had a desire to play with bias tape for months. So I did. I took one of my longarm curved rulers and drew opposing curves on a Pastel Almond Fossil Fern fat quarter. I didn't center the curve; I just plopped it on. When I drew the opposing curve, I only measured so that the tops and bottoms of the curves matched the first curve. 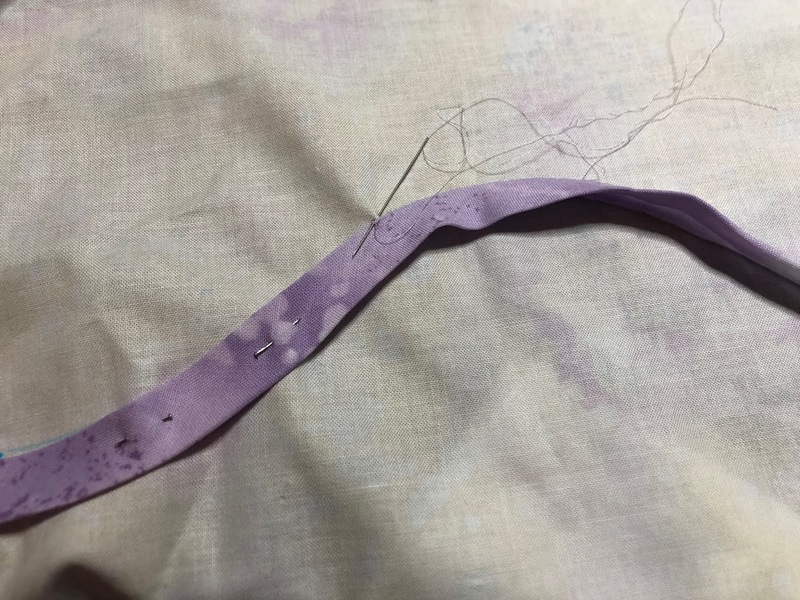 I cut bias strips from Fossil Fern Wisteria, pieced them together, and made 1/2" bias tape. Then I appliqued it to the curve using InvisiFil thread, applique pins, and a straw needle. I really enjoyed this small bit of hand stitching while I sat and visited with family this weekend. This is either going to be the best quilt ever or a total mess. I'm ok either way and look forward to more small moments of play in the near future. I had a plan for the quilting, and the plan worked out even better than I hoped! 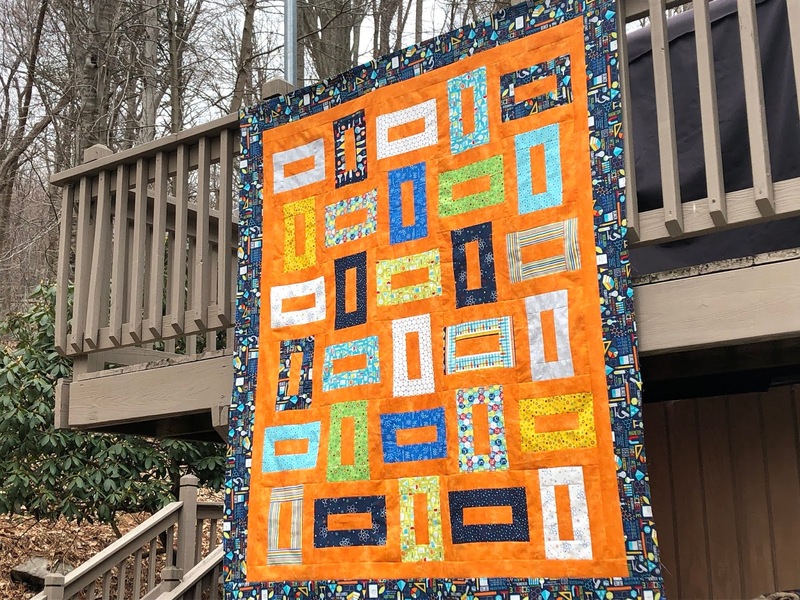 Check out this class and learn how to not be overwhelmed by a large quilt and how to have fun randomizing a design. It's ribbon candy perfection and I just had to take a photo of it while it was on my lap. My niece described it as "woodsy/earthy" so I got a great idea. "Why don't I go outside in the back of the property on a really windy day while there is wet mud under the leaves and try to take photo?" So I nearly killed myself climbing up to this rock. It's not far but it's steep, well over a 45* climb. The rock is about as tall as I am and I thought I'd drape the quilt over it for a photo. Well...… the top of the rock is at an angle and the quilt kept slipping down. I had to keep dropping my camera to catch the quilt before it hit the mud under the rock. Approximately 134 times. 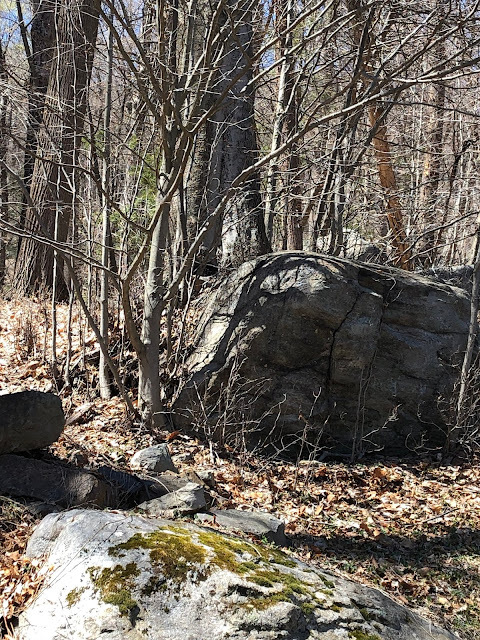 So I decided to drape the quilt in the tree next to the rock. Yes, there's a shadow on the bottom because of the WIND WARNINGS. This is as good as it gets, folks. And now you know how far I'll go for a quilt photo. All the way to the back yard. To twist my ankles, get muddy, say some colorful words, and entertain the neighbors. I'm over-the-moon thrilled to be a part of Sheri Cifaldi-Morrill's Typecast of Characters Blog Tour! Check out all of the details HERE. I'm learning how to best adapt English Paper Piecing to the special limits my hands have. Stay tuned for more information about that. As I've mentioned many times, I'm a self-led student of WWII history. My most recent read was Panzer Commander by Hans von Luck. I've watched Das Boot and other movies from the opposing side of the war, but this was a completely different view of history for me. Hans von Luck was a decorated tank commander, Russian prisoner of war, and after his release a good friend of many of his Allied opposing commanders. Much of my WWII learning is done whilst quilting and driving because of audiobooks. I make good use of my library's books on CD and my Audible account. Bronson Pinchot read this book with a fab-u-lous German accent. Do you remember Bronson Pinchot as the wacky Balki from Perfect Strangers? Bronson Pinchot has 328 entries on Audible, so apparently he has quite a career in audiobooks. A good narrator/reader can make a book come alive, and Mr. Pinchot has this talent. He's joined Dylan Baker, Jim Dale, Davina Porter, and Patrick Lawlor on my list of favorite readers/narrators. Stonehenge 10th Anniversary Block Party! 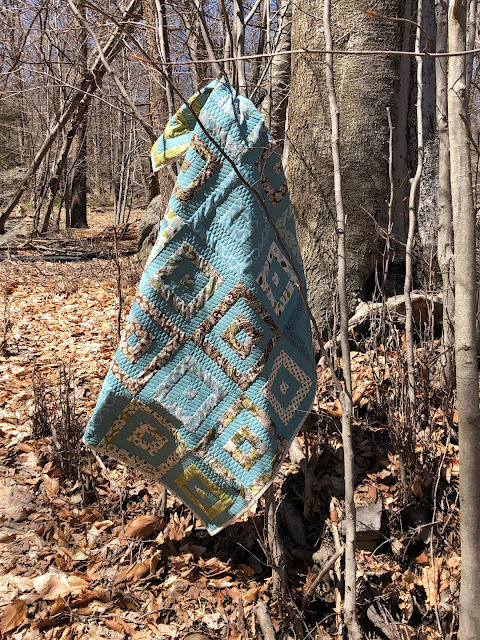 Northcott's Stonehenge Fabric is 10 years old and they are throwing a party. A block party, of course! I filmed a machine quilting tutorial showing how I quilted this block. 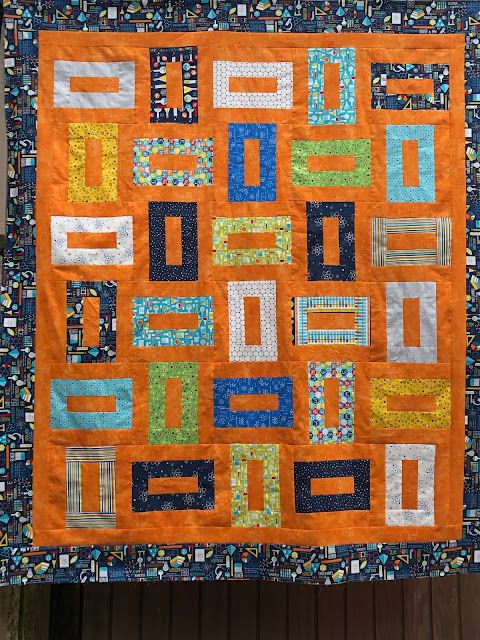 Be sure to check out all of the other Stonehenge 10th Anniversary Block Party quilt blocks! As soon as Big Bang fabric was announced, I knew I need to own it. And make a quilt with it. So I did. This is my Fenced In Cutie Pattern featuring Big Bang Fabrics by Northcott. 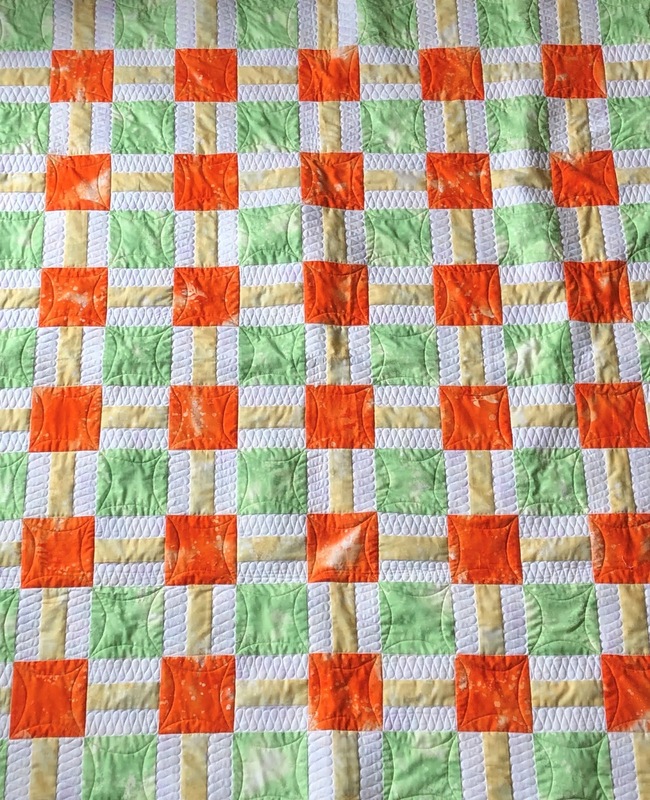 I have kits for my Fenced In quilt on my website. Some people commented loving the photo and my yard. 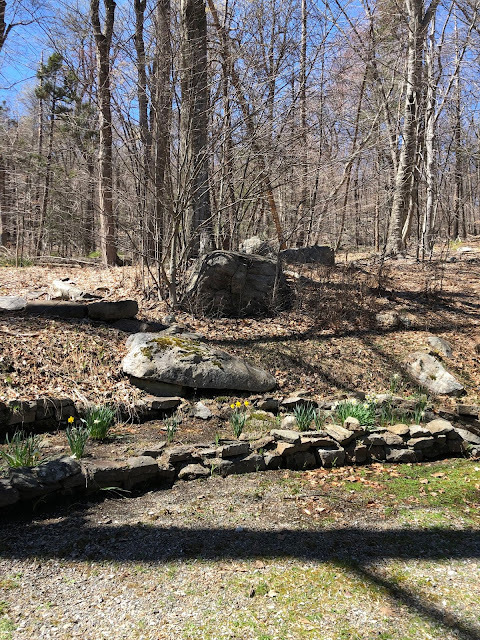 From a desire to keep it real, here's my outdoor photo setting. I carefully aim my camera to avoid showing everyone the less pretty part of my life, but everyone has garbage cans, right? And many of us also have LP gas tanks at our houses. I took a boring photo of the quilt for planning purposes, because when I get home from MQX, I plan to film my next "How Do I Quilt This?" 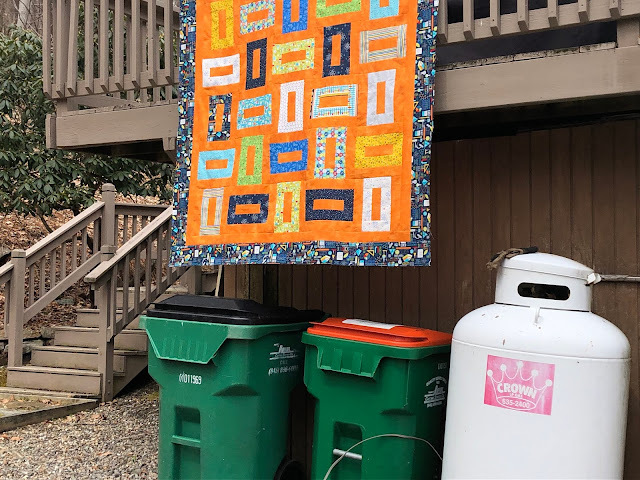 machine quilting class using this quilt! I have some wildly fun and crazily easy free-motion quilting plans for this quilt. I can't wait to show them to you! Stay tuned for more upcoming quilting fun. Quilting this quilt while filming the "How Do I Quilt This?" class at the same time was a wild ride. I had a plan for how I was going to quilt it, and the quilt had other ideas. I'm glad I listened to the quilt because I love the finished product. I even took it for a test ride when it was done, and it was perfect for a quick nap! 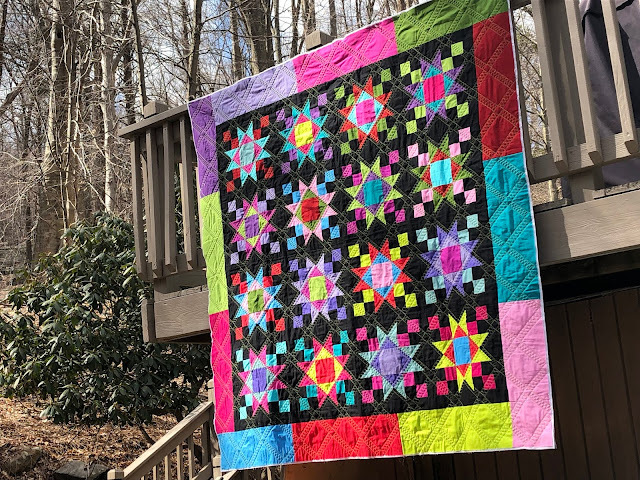 If you want to make this quilt for yourself, buy the kit HERE. 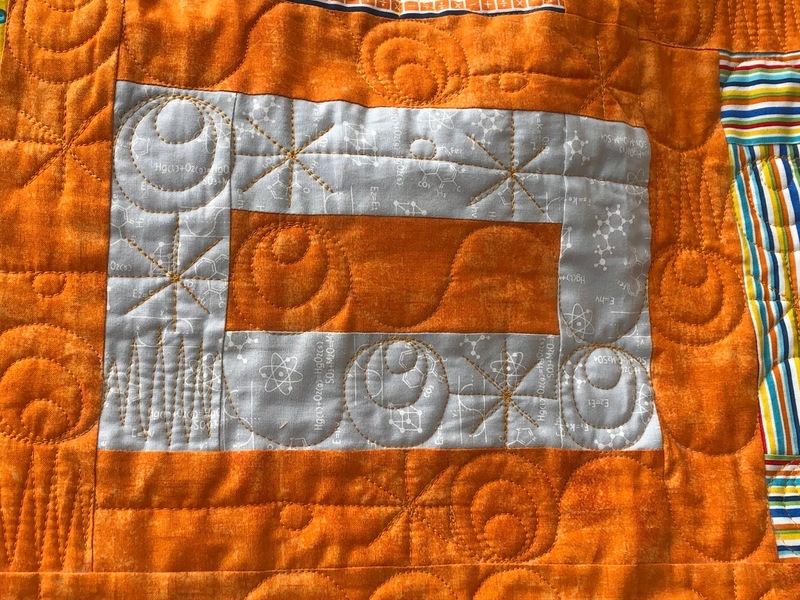 If you want approximately 45 minutes of video instruction about how to machine quilt this on your home sewing machine (including design ideas), buy the class HERE. I am now filming all of my quilts as I quilt them and offer the "as it happens" class to you at a low price ($5) so that you, too, can have the extreme satisfaction of finishing your quilts yourself on your home sewing machine. Sparked by my recent trip to New Orleans and a day spent at the WWII Museum, I'm reading everything I can find about WWII and the years leading into it. 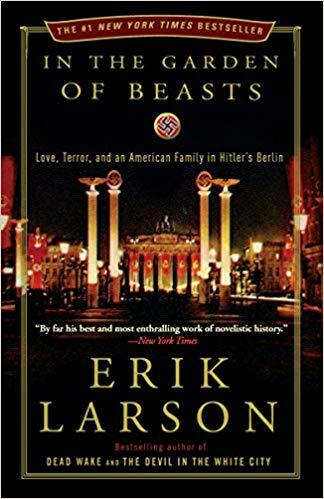 I just finished reading In the Garden of Beasts by Erik Larson. It is an account of the years that William Dodd was the US ambassador to Germany in Berlin (1933-1937). It dealt heavily with the life of his 20-something daughter Martha. I was aware of the lives of most of the main players and the "Night of the Long Knives" purge*, but this book held many written accounts of the attitudes of US politicians toward Germany as well as the attitude of Americans and Europeans toward their Jewish neighbors. News reports of "The Nazis are bad" versus the diplomatic reports of "It's not like that, really" were shocking to contemplate as well as many other prejudices of the times. Being born in the 60s, the life of an adventurous communist woman of the 30s was interesting/shocking as well. Note: don't mistake this for Jeffery Deever's novel of a similar name (which is on my to-read shelf currently). *For an overview of the Night of the Long Knives, watch "Hitler's Circle of Evil" on Netflix, episode 3, Fall of Rohm. 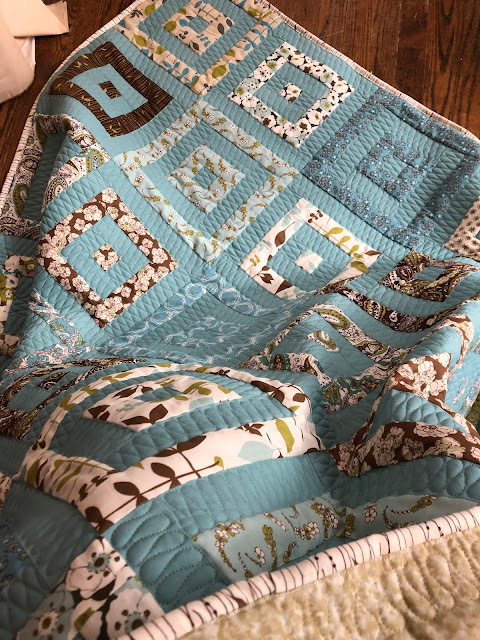 Did you know that I am absolutely in love with quilting with my walking foot on my home sewing machine? 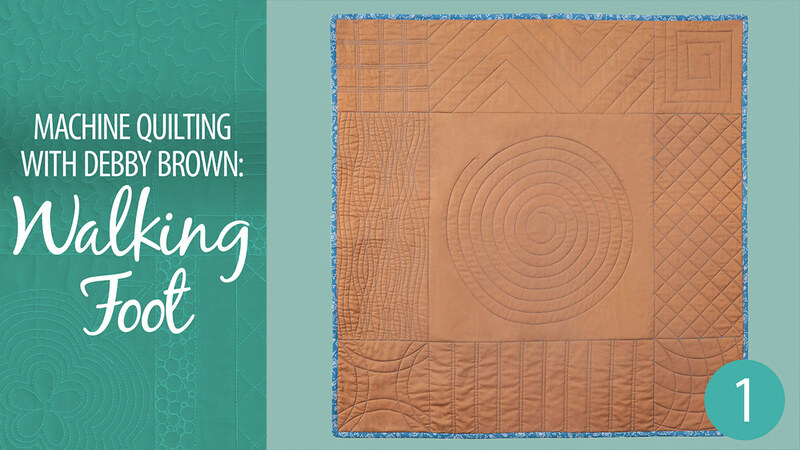 Learn to finish your quilts on your home sewing machine with machine-quilting expert Debby Brown! In part two of this Quilter's Skill Builders series, you will practice quilting many different types of curved lines. Join Debby to practice echoing, parallel, curved cross-hatching, curved corners and triple wiggly lines. 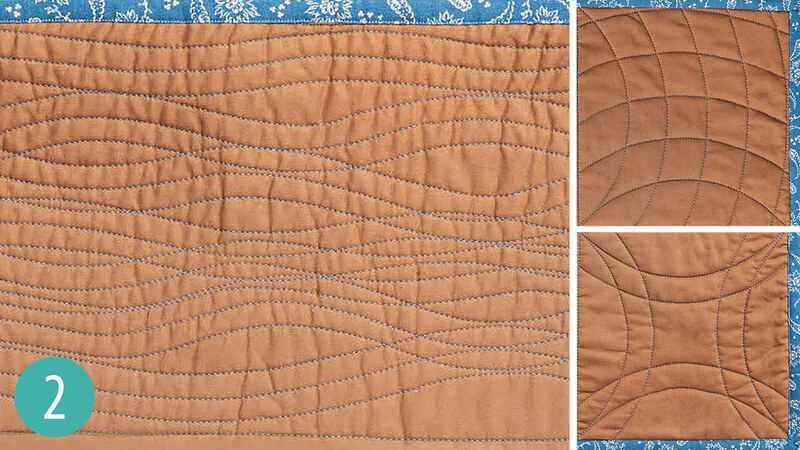 • Quilt curved lines on your home sewing machine. • Secure starting and ending stitches. • Stitch echoed or parallel curved lines. Check out the intro video! Annie's Creative Studio is a subscription-based platform where you can learn from experts (like me!) 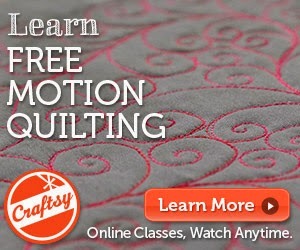 how to quilt, knit, crochet, and more! If you aren't a member yet, sign up for a free trial to watch the entire episode. I am 99 and 44/100% a quilter. There are other interests that consume me, however. I read voraciously and most of what I read is about WWII. 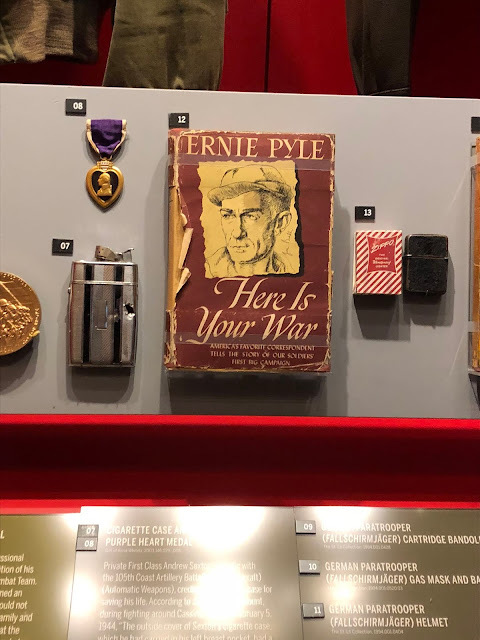 When my husband and I recently went to New Orleans, LA we visited the WWII museum. I can't say enough about how amazing that place is! My trip to the museum sparked anew my desire to read every book and watch every movie about WWII. I just read Munich by Robert Harris. I read his novels about Cicero and LOVED them, so when I learned about this book I knew I had to read it immediately. You may disagree with my idea that I can learn about history from novels, but I believe that I can. They make the subject interesting enough for me to research it for myself. Munich is about the Munich agreement reached on September 30, 1938. The Munich Agreement is signed by Germany, France, the United Kingdom, and Italy. The agreement allows Germany to annex the Czechoslovak Sudetenland area in exchange for peace in an attempt to appease Hitler. I knew the broad strokes of this agreement, but the novel encouraged me to dig deeper and made me see Neville Chamberlain in a more sympathetic light. I've never been a big Chamberlain fan. Am I the only one obsessed with a specific time in history? 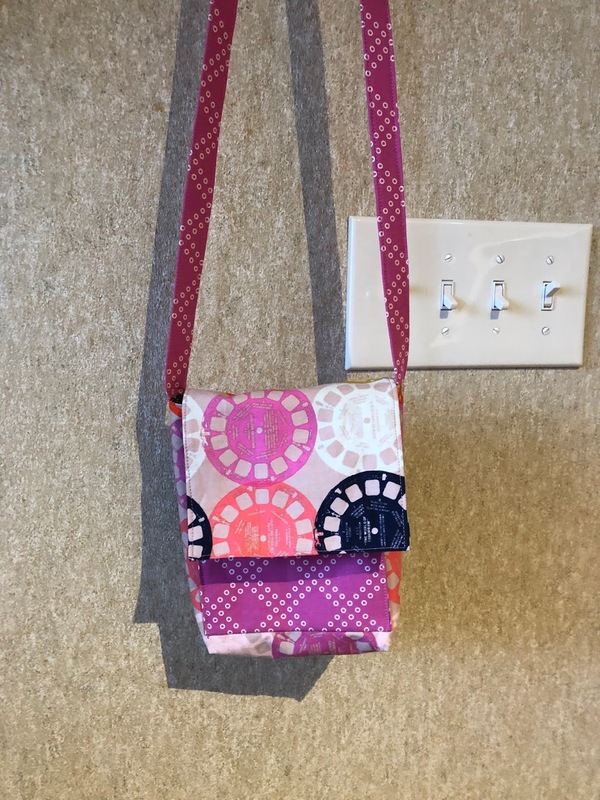 I have a favorite purse pattern, The Potato Chip bag. Ask for it at your local quilt shop. I have made over a dozen of these cute and easy bags and since I am headed to my first show of the 2019 quilt season, I decided it was time to make myself a new bag. I broke into my well-protected stash of Cotton and Steel fabrics, selected a few fat quarters, and set to work! Isn't this the cutest bag you ever did see? Look for it (and me!) at the American Quilt Society show in Lancaster PA this week. 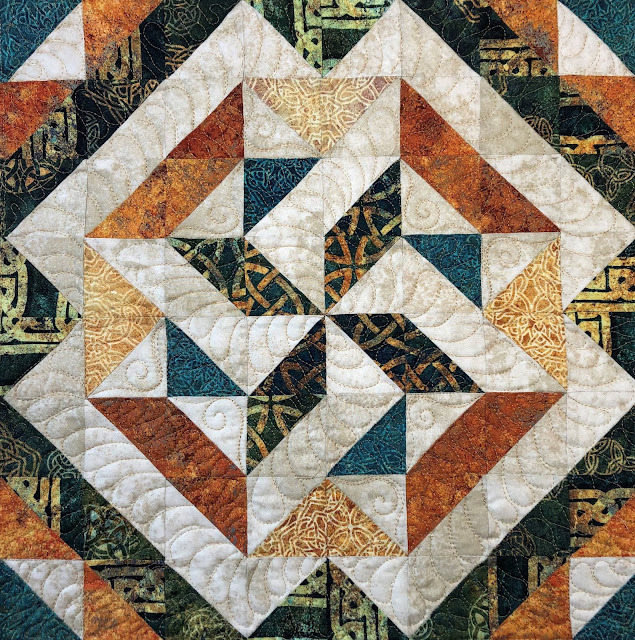 I'll be in the Handi Quilter booth sharing Handi Quilter love with all of the quilters. That noise you heard was me squealing with excitement. I. Just. Published. My. First. Online. Class!!!! 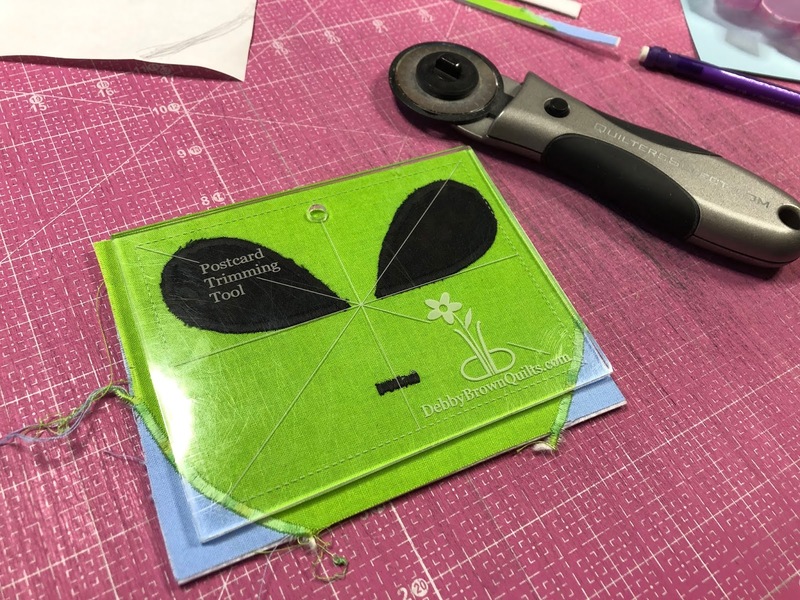 I have filmed for Craftsy, Annie's, and Annie's Creative Studio, but this is the first time I've filmed a class by myself and am presenting it directly to you. I decided to start filming as I'm quilting my quilts and putting them together as inexpensive classes so you can learn at home. The first class I chose to release is Arbor. I am nervous. And excited. And nervous. But really excited. Check out the class HERE. Between medical treatment recovery time, losing a month to "lung crud", and travel for work (and play!) 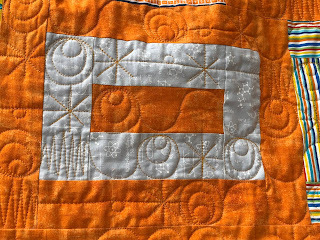 I don't feel like I've had much fun quilting in 2019. I've decided to incorporate more play into my quilting starting NOW. I pulled out my set of Bloom Templates from the Bloom quilt that I never finished (I decided to hand applique it instead of following the directions and using the sewing machine and it is now just another one of my un-finished hand applique projects). There are so many adorable shapes in there and I decided to play with them and make some nutty postcards. I used template number A-16 to make great big alien eyes on a postcard. 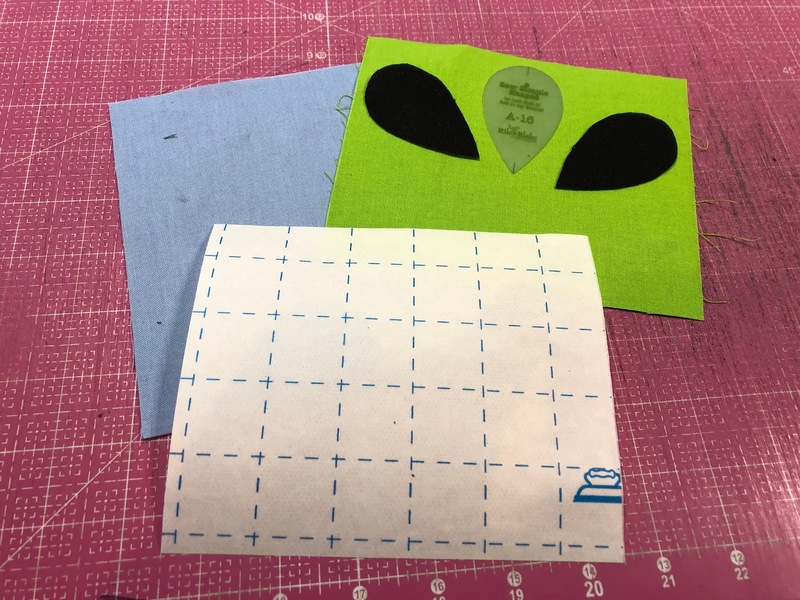 The green and blue fabrics are 5"x6". 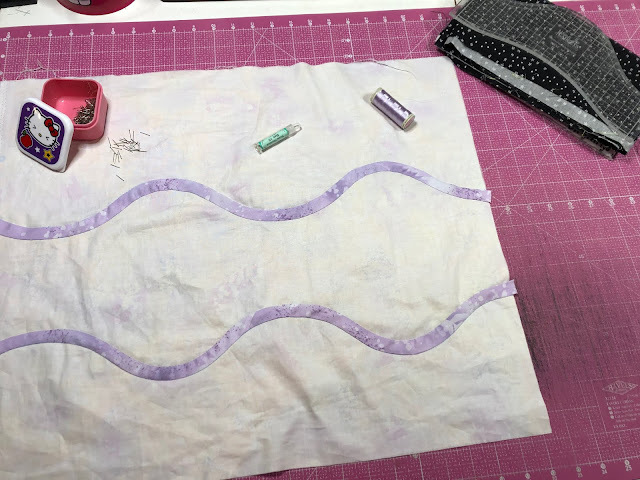 I use Steam a Seam 2 for my fusible applique. 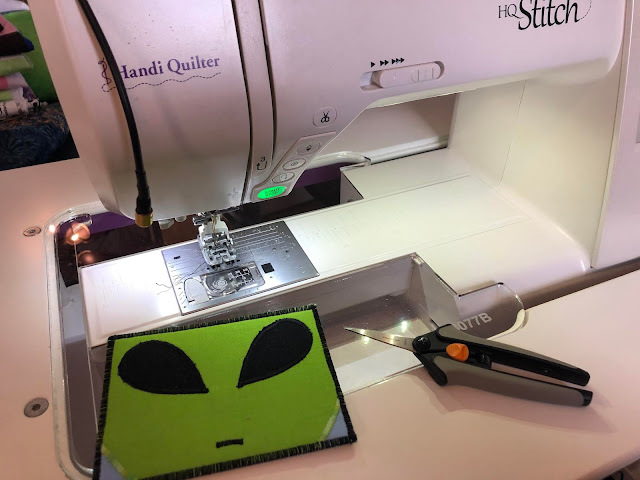 When I machine applique, I use a tear-away stabilizer. I tried something new with this postcard: cardstock for the back instead of fabric. 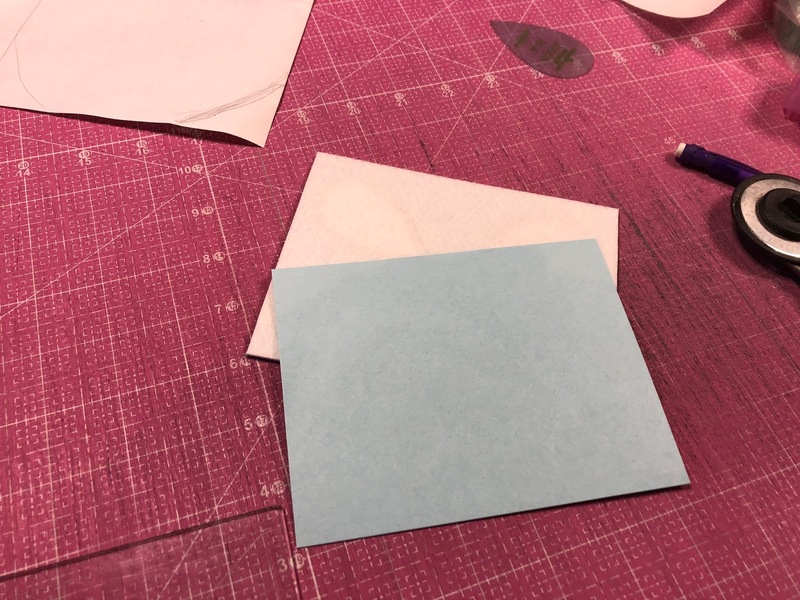 I've been having trouble writing on fabric postcard backs and the cardstock is SO MUCH EASIER to write on! This postcard makes me stupidly happy. Today is my 31st wedding anniversary and I'm giving this to my husband with a clever note on the back. He already has me, so he already has everything and needs no gifts. Right? I have about 30 different ideas of odd things to make from the Bloom Templates that have nothing to do with Bloom. Is this bizarre? Or a creative exercise? I don't really care much about the answer because I'm having loads of fun. Stay tuned for more creative prompts thanks to my Bloom Templates. New ACS Episode: Houston Quilt Market New Fabrics! 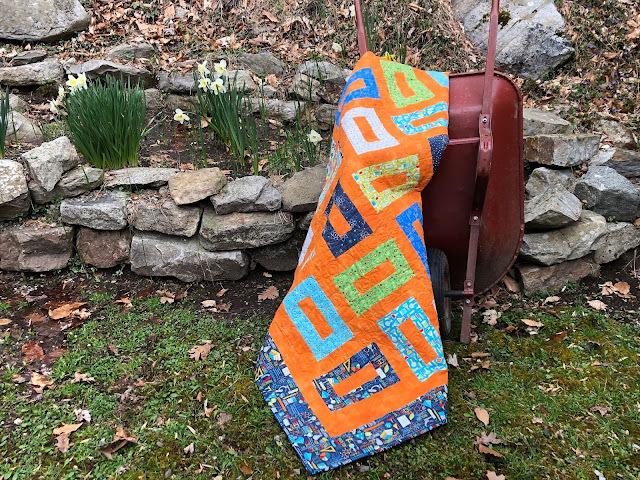 If you are a quilter and active on social media, you've seen the "Look at these new quilt fabrics just released at Quilt Market!" posts. 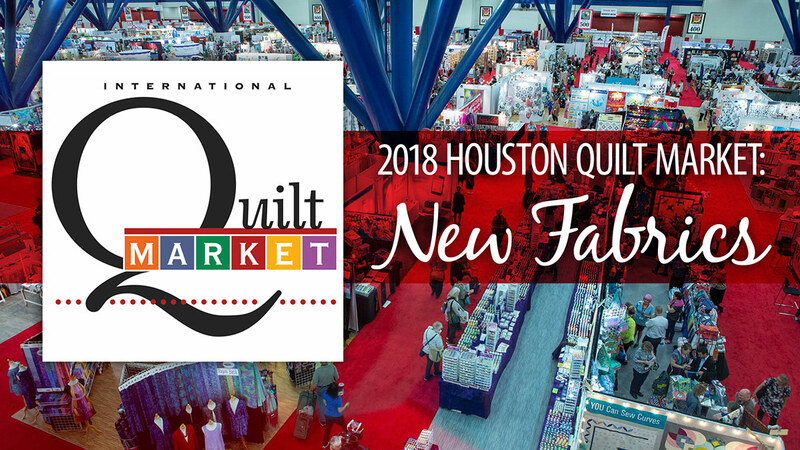 Every October/November, Quilt Market takes over Houston, Texas and the inspiration there is breath-taking! I filmed an episode of Annie's Creative Studio featuring new fabric lines and interview with their designers! Do you ooh and aah over all the gorgeous fabrics in your local quilt shop? Don’t miss this Products We Love episode as we tag along with quilting expert Debby Brown at the latest Houston Quilt Market. 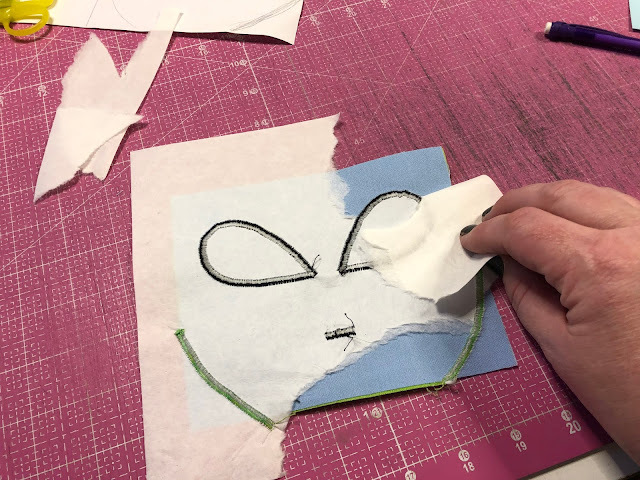 Join Debby as she discovers unique designs and beautiful colors from preeminent designers and several of the finest fabric companies in the world. • Which new fabrics will be available in 2019. • About the inspirations behind many new fabric lines. 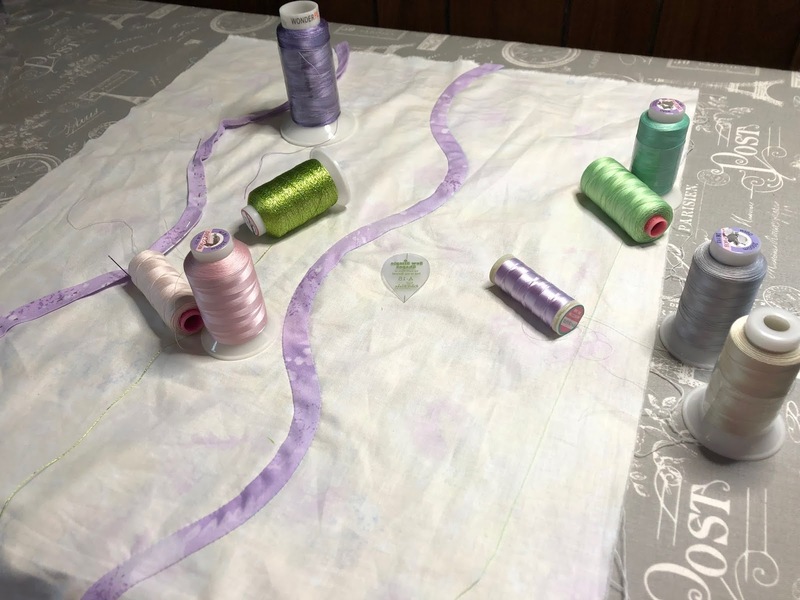 • How to plan upcoming quilt projects based on new fabric arrivals. Annie's Creative Studio is a subscription-based platform where members can watch an unlimited number of classes about quilting, knitting, crocheting and more. If you aren't yet a member, sign up here for a free trial. If you are already a member, sign in, search for the episode, and learn the stories behind your favorite fabrics!